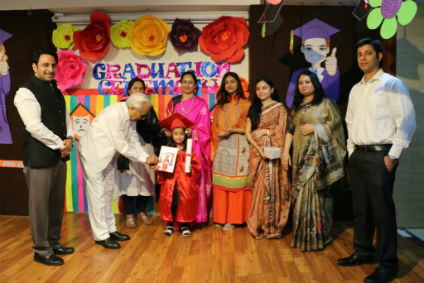 Gurgaon: Graduation Ceremonies were organized for KG, Primary and Pre-Primary students at KIIT World School. The program started with special Prayer in which teachers and students took part. Advocate and social worker Alka Dalal, District Education Officer Mewat Dinesh Shastri, KIIT Chairman BR Kamraah, other senior faculty members were present at the meeting. During this period, the students promoted from the pre-school to the first class were honored. Similarly, children from the Pre Nursery and Class II have made five groups and delivered the message on “Emotion” theme through dance, poetry and drama. Every group has explained the aspects of emotions differently, such as the war and peace, unwavering principle between mother and child, compassion, humor and surprise.